AG and Sons: How To Choose Modern Engagement Rings? How To Choose Modern Engagement Rings? The engagement ceremony is one of the most important events before the wedding ceremony. While some people have their engagements well in advance of the wedding, some have it on the same day or just few days before. The engagement ring is the most important part of this ceremony. Many people wear this ring on their fingers for lifetime. Therefore it is important that the ring should be a classic one. Most of the engagement rings look the same with a precious stone setting in the center and the main base of the ring in some precious material like gold, white gold, silver or platinum. The round-shaped rings have become too outdated. How about choosing some different designs for the rings to bring in a change? Curved rings are in vogue and look very stylish and elegant at the same time. It is interesting to note that in majority of the cases, these curved rings come in the sets of wedding ring and engagement ring. This helps both the rings to set well and one can wear both the rings on the same finger without any mismatch. The finished look is awesome. Heavily embellished and bold designs of engagement rings are out of the fashion now. People are looking for simple and sophisticated designs for their engagement and wedding rings. Minimalistic approach is the main theme of the rings. It is obvious that majority of the engagement rings have some precious gemstones studded in them. The setting of the stones can be in a little different manner. Engagement bands can be simple ones with diamonds scattered throughout the band making it look extremely classy and stylish. Again the diamond setting can be in tension setting or in a V-shape. The combination of diamonds and platinum is a favorite for engagement rings. However, along with this combination, colored gemstones are also becoming popular choices with people. 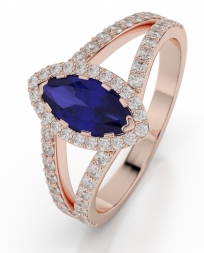 For instance, on a rose gold base, dark colored gemstones would look awesome. These combinations are rare to find and if you can get one, you can flaunt the ring in style. With light base color of the ring and dark colored gemstones, the engagement rings look nothing short of wow! Online jewelry shopping has become a popular trend now. The only thing that you must be sure of is that the store should be an authentic one. One such store that needs special mention is agnsons.com. The online store deals with hallmarked jewelry, which stands for its genuineness and authenticity.